February got off to a good start as we welcomed three lovely new greyhounds from Ireland. Hopefully, Brandon, Connie and Lady won't take too long to find their forever homes. 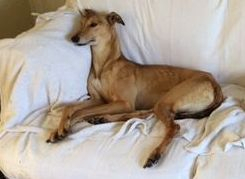 Brilliant news little Abbie has found her new forever sofa in Little Stoke with Paula, Nick and their lovely lurcher lad, Indy. Abbie was a greyhound which recently came from Limerick. Thank you for giving Abbie a second change in life. Thank you to our kind friend Wendy for yet another generous donation. Dave, Lynne, Barbara and Ciaran had a stand yesterday at the Warminster Model Railway Exhibition and raised an amazing £141.50. 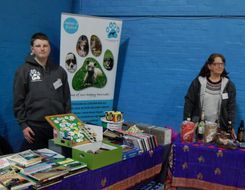 Thank you so much for raising funds for Bristol DAWG – you are all very kind. Thank you so much to Catherine Neck for the generous donation of your birthday money - you are very very kind. Sorry to tell you that the evening of talks scheduled for 24 February, by Viking Vets, has been cancelled. Massive massive massive thank you! Megan, Kim, David and Debi have raised an amazing £1,757.50 undertaking a charity auction for Bristol DAWG. We are soooooooooo grateful, as are the dogs in our care, without such kind people we would not be able to help the number of four legged friends we do. Thank you to everyone who bid so generously and also to the very kind people who donated items. 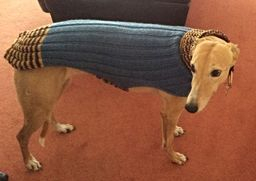 Massive thanks to Marion Tasker who has once again knitted more wonderful greyhound coats for our kennel dogs. You are extremely kind Marion and we are very grateful for these coats. Coat above modelled by Amber, Gerry's cheeky little girl. We would like to say a massive "thank you" to Waitrose in Clifton for nominating us as one of their charities for the month of December. We have today received a cheque for £190.00. Thanks to Waitrose and to all their customers that voted for us.